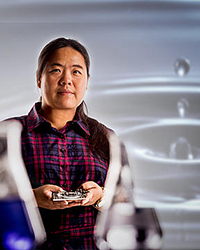 A patent for a device that allows scientists to capture the moment when a liquid drop, smaller than a pinhole, reacts on a solid surface has been granted to Dr. Xiao-Ying Yu and her team at Pacific Northwest National Laboratory. They created a device that allows powerful imaging instruments—such as scanning electron microscopes, time-of-flight secondary ion mass spectrometry—to study liquid samples reacting in real-time and a realistic environment. The device is part of a new imaging capability that combines microfluidic, chemical physics, electrochemistry, and sensitive surface techniques. "This is a tremendous innovation for in situ studies as a new means to interrogate the chemical language of microbial system interactions, as well as being relative to the discovery and development of new electrode materials for energy storage," said Dr. Louis Terminello, who leads chemical imaging work at PNNL. Yu's team included EMSL scientist Zihua Zhu, PNNL scientist Matthew Marshall, and Bingwen Liu and Li Yang, former PNNL postdocs. The device is small enough to fit in the palm of a hand, works with many scientific instruments including time-of-flight secondary ion mass spectrometers and scanning electron microscopes. It requires as little as two drops of a liquid for the instrument to analyze the sample, and does not require special sample preparation that can alter or destroy the sample's integrity. Yu earned a Ph.D. in Physical Chemistry from the University of Michigan. She did her postdoctoral work at Brookhaven National Laboratory and before coming to PNNL she was a staff scientist at Colorado State University. This is the second time her work has led to a patent. Reference: XY Yu, B Liu, L Yang, Z Zhu, and MJ Marshall. 2016. "Microfluidic electrochemical device and process for chemical imaging and electrochemical analysis at the electrode-liquid interface in-situ." U.S. Patent Number 9,274,059 issued to Battelle Memorial Institute.